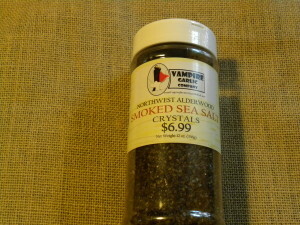 Alderwood smoked salt comes from the Pacific Northwest. It consists of coarse brown grains of sea salt that are naturally smoked over real alderwood as opposed to being flavored by oils or maltodextrin. Our smoked sea salt has authentic flavor without any strange aftertastes that are present in artificially colored/flavored smoked salts. For hundreds of years, alderwood smoked salt has been used to flavor meats such as beef, chicken and salmon, making it a true Northwest tradition. It can also be added to roasted sweet potatoes, asparagus, mushroom risotto, or used to top caramel creme brulee. GLUTEN FREE, SUGAR FREE, NO MSG!